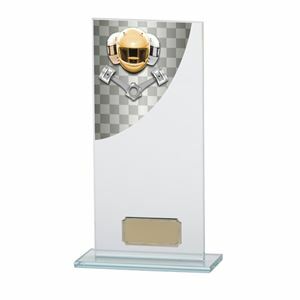 The Colour Curved Cricket Glass Trophy is made from premium clear jade glass with bevelled edges and is 5mm thick. The self adhesive curved image is printed on quality acrylic. The crystal trophy features a vivid colour action cricket batsman and stumps. 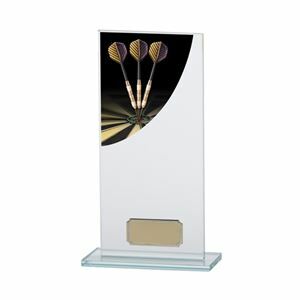 This premium bevelled edged Colour Curve Darts Glass Trophy is made from 5mm thick clear jade glass. Featuring on the crystal plaque is a sharp colour image of 3 darts on a bull's eye. This self adhesive curve is made from a quality acrylic. 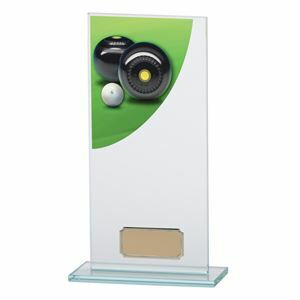 Made from premium 5mm thick clear jade toned glass, the Colour Curve Lawn Bowls Glass Trophy stands on a small base and is enhanced with bevelled edges. A self adhesive, vibrant image of two bowls and a jack against a green background is supplied with this award and is designed to be applied to the top left hand corner of the award. The image is topped with acrylic to provide extra protection and shine. This premium crystal plaque has a rich colour image featuring a close up of pool balls. The acrylic curve has a superior quality print and is self adhesive. 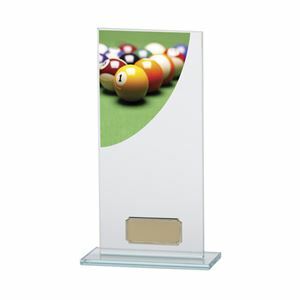 The Colour Curve Pool Glass Trophy is made of jade toned 5mm thick clear glass and has bevelled edges. 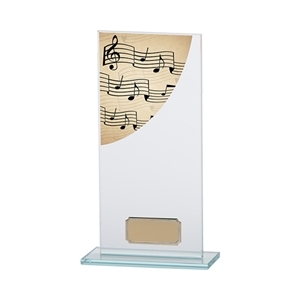 This Colour Curve Rugby Glass Trophy is made of 5mm thick jade toned clear glass with bevelled edges. The premium crystal plaque has a vivid action image of a rugby player with a ball. The curved image is printed on a quality acrylic and is self adhesive. 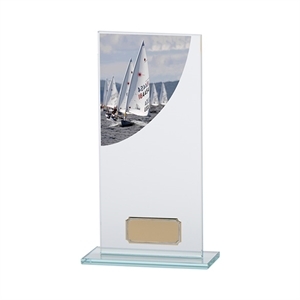 The Colour Curve Sailing Glass Trophy is made of premium 5mm thick jade toned clear glass with bevelled edges. The crystal plaque features a vivid image of sailing boats. This curved image is self adhesive and printed on a high gloss acrylic.